Angela and I have gone out to a restaurant for dinner on Valentine’s Day exactly once. From the crowded restaurant to the subpar, but expensive food, it was an experience that we didn’t want to repeat. So last year we went to our favorite pizza place. Given that Valentine’s Day was on a Saturday this year, I decided that I would make a special dinner for Angela. 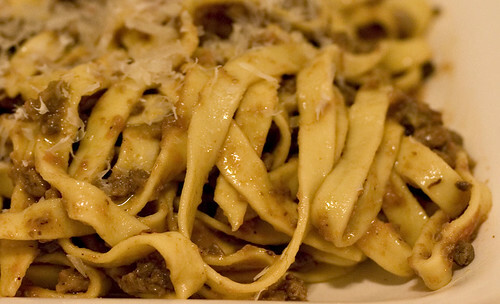 I decided on Tagliatelle alla Bolognese as it is one of Angela’s favorite foods. I made some bread and crème brûlée. And then I went and ruined it by spilling hot chicken stock on my toe. I had taken advantage of the fact that I had to stay home to watch the sauce to make a large batch of chicken stock. All was going well until I was about to strain it. I cook the chicken stock in a stock pot with all the solids inside a pasta strainer. To get as much liquid out of the solids as possible, I had picked up the strainer and was trying to push any remaining liquid out. This is when tragedy struck. The strainer slipped out of my hands, sending chicken stock flying. Some of it flew up and landed on my sock-clad foot. I got the sock off as quickly as possible but the damage was already done. My foot is finally starting to heal, a week and a half later. I’ve been forced to wear sandals and socks to work since then. It did, however, take my manager until yesterday to realize that I was wearing them and duly make fun of me. Apparently wearing orange toed socks makes it more conspicuous. Luckily, I only ruined the romantic mood on Valentine’s Day and not the food itself. The bread and crème brûlée were done. All that was left was to make the fresh pasta and it helped take my mind off the pain. Angela can comment on the funny dance I did to distract myself further. Bolognese sauce is deservedly one of the most classic Italian pasta sauces. The long cooking in milk and wine helps mellow the beef to almost be reminiscient of veal. It also helps mellow the normally acidic bite of tomato sauces. In many ways, however, it almost seems to be the anti-Italian pasta. It’s one of the few times in Italian cooking where the sauce is the star and the pasta merely the sideshow. Despite my mishap, this was still the right choice for Valentine’s Day. It’s a special meal, taking a good bit of time. But that time and effort pays off in a dish that can only really be described in superlatives. Put the oil, 3 tbsp butter, and the onion in a large dutch oven and place over medium heat. Cook the onion, stirring occassionally, until it has become transluscent. 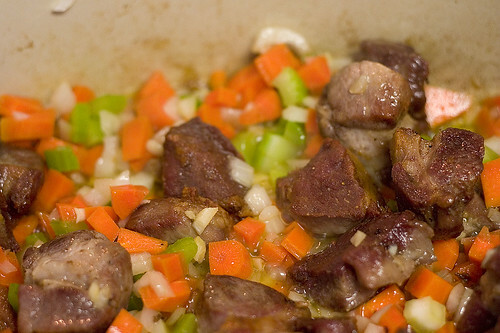 Add the celery and the carrot and cook for about 2 minutes more, stirring regularly. Add the ground beef and ground pork. Season with salt and pepper. Cook, stirring the meat, until it loses its pink color. Add the milk and bring to a simmer. Cook at a low simmer until the milk has completely cooked away, 30 to 40 minutes. Add the wine and bring to a simmer. Cook at a low simmer until the wine has completely cooked away, 30 to 40 minutes. Add the tomatoes and bring to a simmer. Cook at the barest of simmers for 3 to 4 hours, stirring occasionally. If the sauce dries out, add 1/2 cup of water, whenever necessary. 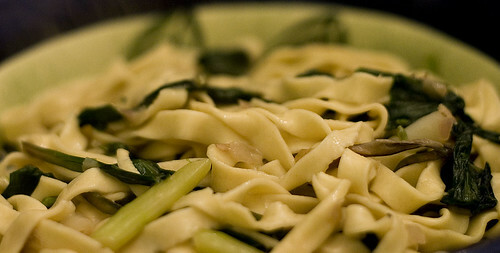 Cook the fresh pasta and toss it with the sauce, adding the final tablespoon of butter. Serve immediately with grated parmigiano-reggiano. When I announced to Angela what I was making for dinner last night, she was distinctly less than excited. 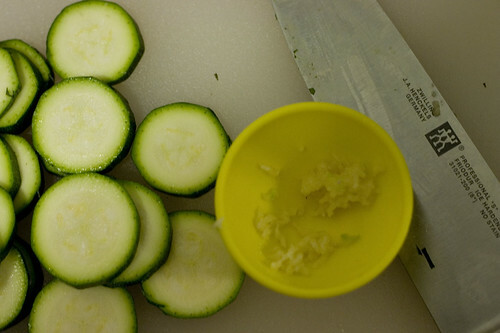 In her defense, my motive for choosing this recipe was mainly that I had a zucchini that had been sitting in the fridge long enough that I had started to worry whether or not it had turned into a home for something else. Luckily for us it had not. I say luckily as both Angela and I enjoyed it immensely. This pasta was significantly better than it had any right to be given its ingredients. It’s very simple and I always appreciate simple food but, looking at the recipe alone, I didn’t see anything that would differentiate it from the mass of other pasta recipes that have a base of tomatoes. However, the distinct flavor of the fried zucchini slices makes the dish truly compelling. It provides a nice counterpoint to the acidity of the tomatoes. The peas are nice but mainly from a color and nutritional perspective. But what will really keep me coming back to this recipe is how quick it is to make. The longest part of the preparation is waiting for the water to boil and then cooking the pasta. The sauce can be made entirely in the time that the pasta cooks. It also reheats the next day fairly well. Bring a large pot of salted water to a boil and cook the penne for one minute less than the manufacturer’s instructions. Meanwhile, heat the oil in a large skillet over medium-high heat. 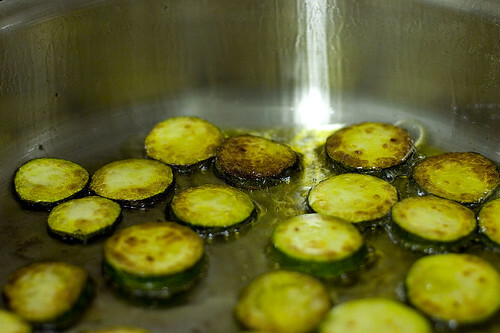 Add the zucchini and cook until both sides are golden brown, about 3 minutes per side. Add the garlic and stir briefly. Add the tomatoes and season with salt and pepper. 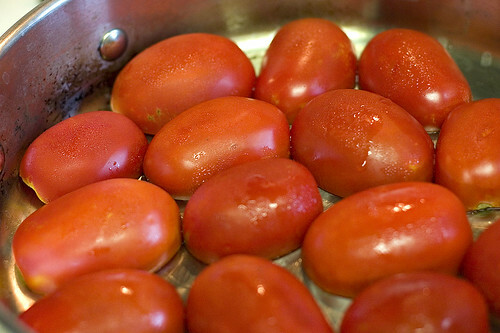 Cook over high heat until most of the tomato juice has evaporated, about 4 minutes. Add the peas and the butter and cook over low heat until the peas are warmed through, about 1 minute. Drain the pasta, reserving the pasta water. Add the pasta to the sauce and cook for one minute over medium heat, stirring regularly. If the pasta is dry, add some of the reserved pasta water. Remove from the heat and stir in half of the parmigiano. Serve sprinkled with the remaining parmigiano. As previously mentioned, Angela and I have been in the processing of moving for the last month. In the beginning of November, we packed up (or more precisely had movers pack up) our apartment in Long Beach, CA. Two days later we flew to Washington Dulles and made our way to Alexandria, VA late at night, dropping off our cats with my parents on the way. In the course of waiting for our household goods to arrive and looking for a new place, we were staying in a hotel. While hotels are wonderful places to stay when you’re on vacation, they’re far from ideal as a residence. I intentionally had picked a hotel that claimed it had a full kitchen. Apparently, a full kitchen means a refrigerator, dishwasher, two electric burners, awful pots, and no oven. My best laid plans of regularly cooking dinner there were quickly dashed if only because the pots (there was nothing that would qualify as a pan) were beyond awful. But we did manage to eat in part of the time. And that’s one of the major reasons for lack of posts here. There simply wasn’t anything to post about (as well as some other logistical problems; I had my camera but didn’t have the computer I need to edit photos). But that part of our moving ordeal (and what move isn’t an ordeal?) is over. We have moved into our very own (rented) townhouse in Old Town Alexandria. We have our cats who are still terrified and huddling in the basement. We no longer have a dish washer. The kitchen is tiny but I’ve appropriated the sun room for storage and a prep area. My parents hated our old couch that they bought us a new one. We’ve spent more at Ikea that I’d like to admit and we still need to make another trip there. We have our Christmas tree up. While it may not be quite there yet, it’s slowly turning into home. And last night, we had our first dinner guest. My cousin Alison drove down from D.C. Because she’s family, I had no issue with using her as a guinea pig for a new recipe. I had purchased some ricotta at the Alexandria Farmer’s Market that I needed to use. I originally thought of ravioli but I didn’t quite have that much time on a weekday (I’m not quite set in my work schedule yet). Instead, I decided on ricotta gnocchi. I had some time to stop at a grocery store so I decided to make the full ricotta gnocchi with the suggested sauce and all. The ricotta gnocchi were very easy to make. Much easier than pasta or potato gnocchi. The sauce wasn’t difficult (it’s mainly chopping) but I had problems with the Italian sausage not producing enough fat so I kept having to add olive oil. There also wasn’t much liquid in my tomato sauce so I had to add water to the overall sauce so that the sauce could actually simmer. This does produce a lot of sauce relative to the amount of gnocchi. It’s almost a more Italian-American ratio than Italian but you can choose to eat as much or as little of the sauce as you choose. 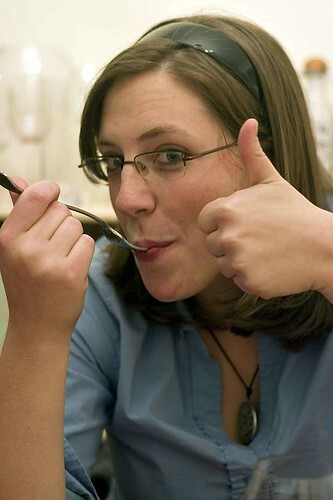 If you examine the pictures, I’m pretty sure you can tell Alison’s opinion of the meal. I heartily concur. Alison was going to look for them at the store but they’re easy enough to make that I’d recommend making them yourself. Place the ricotta in a cheese cloth lined sieve set over a bowl. Cover with plastic wrap and refrigerate overnight. 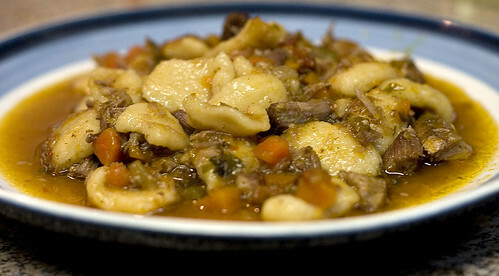 To make the gnocchi, place the drained ricotta in a bowl with the flour, eggs, parsley, salt, pepper, and nutmeg. 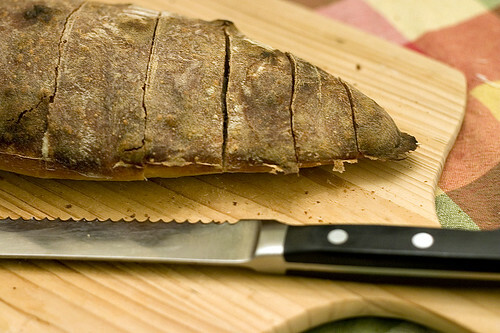 Stir together with a wooden spoon until a soft dough forms. 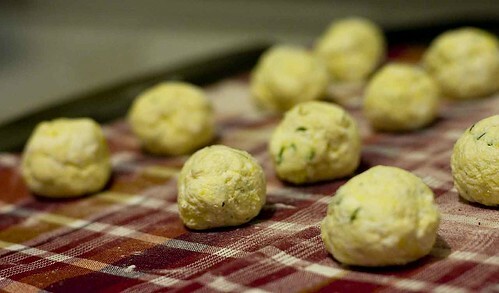 Shape the dough into 2 tbsp balls and place them on a tea-towel covered baking sheet lightly dusted with flour. 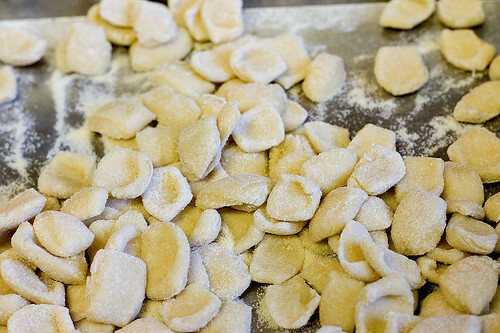 Cook the gnocchi in salted boiling water until they all float, about 7 minutes. Place the cooked gnocchi in an ice bath and transfer them to a bowl. 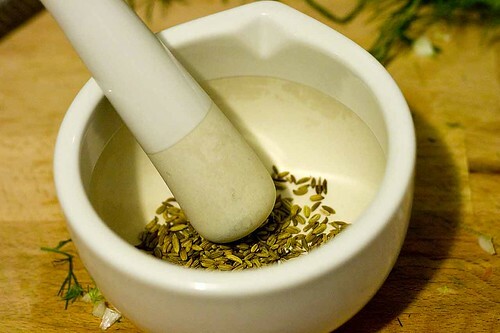 Toss with olive oil and refrigerate until ready to use. In a large skillet, cook the sausage over high heat until it is lightly browned, about 15 minutes. Add olive oil if the sausage starts to stick. Transfer the sausage to a bowl. Add the fennel seeds, red pepper flakes, onion, fennel, carrot, celery, and garlic to the pan cook until the vegetables are softened and browned, about 10 minutes. Add olive oil if needed. Return the sausage to the pan and add the tomato sauce. If needed, add some water to the pan. Scrap up any browned bits on the bottom of the pan. Bring to a simmer and cook for about 30 minutes. 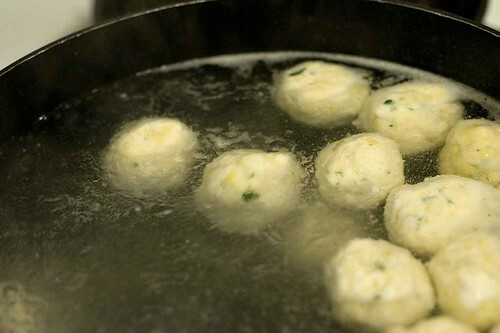 In more boiling water, cook the gnocchi until they again float to the surface. Transfer the gnocchi to the sauce, toss well, and cook for 1 minute more. Served topped with grated Pecorino Romano. 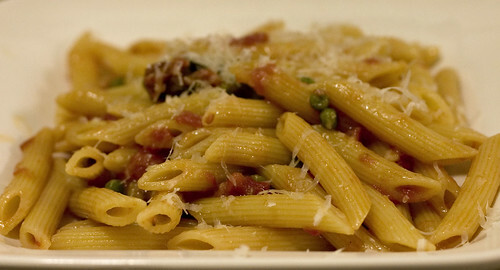 If you haven’t been paying attention, I tend to post a lot of pasta recipes. Here’s one more to enhance my collection. This recipe actually comes from Sting’s personal chef (or so it was stated in Food & Wine). Appropriately, when I started to make this and turned on the radio, a Police song came on. I considered that a good omen. There’s nothing complicated or special about this recipe. It is simple but in its simplicity there is taste and quality. It is a pasta should be. 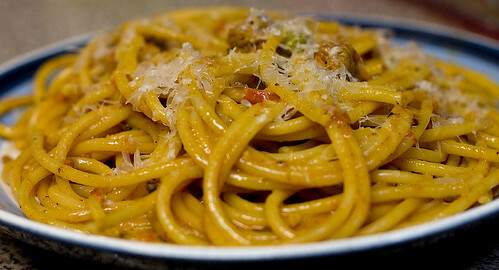 The dominant flavor in the pasta is the sausage; the sausage ends up providing most of the seasoning to the sauce. The tomato sauce and the peas merely compliment the sausage. 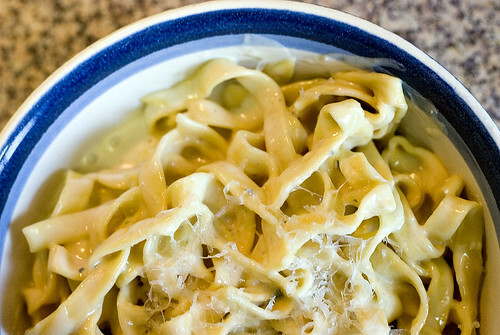 There’s no need to use actual bucatini; any spagheti-like pasta will do. When I made this, Angela was out of town. I made a full recipe any way and ate it for the next two days for lunch. It reheated well and made a good lunch (as long as I remember to bring along some cookies for dessert). In a large saucepan, heat the olive oil over medium high heat. When the olive oil is hot, add the sausage, breaking it up with a spoon, until the sausage is well browned, about 8 minutes. Pour out the excess oil and discard. Add the garlic and shallots and cook until softened, about 2 minutes. Add the tomato sauce and bring to a simmer. Cook, partially covered, at a low simmer for 30 minutes. Stir in the peas and heavy cream and simmer for 10 more minutes. Add half the parmesan cheese and season to taste with salt. While the sauce is cooking, cook the bucattini in boiling salted water for 1 minute less than the manufacturer recommends. Add the pasta to the sauce and cook at a simmer for 1 minute more. Serve immediately topped with the remaining parmesan cheese. Angela left me to my own devices this past week as she was out of town attending a wedding. Some may look at this as a tragedy; I merely look at it as an opportunity to eat things she doesn’t like. In college, I independently developed something similar to this recipe. It developed as an elaboration of a fettucine alfredo recipe I found in a Betty Crocker cookbook that was owned by my roommate. I no longer make that recipe as I’ve moved on to better and (to my thinking at least) more authentic recipes. However, there’s a bit of a story to that fettucine alfredo recipe. It was one of the first things I ever cooked from a published recipe. But, more importantly to me at least, was that it was the first thing I ever cooked for Angela. As documented in the about page, this was an effort to impress here. And apparently it worked. But that has very little to do with this recipe as Angela doesn’t like Gorgonzola cheese (or really any blue cheese) which is why I made this recipe when she was gone. It’s a rather simple recipe. The most time was taken up in making the pasta. My pasta making technique has been modified a bit now. I tend to add a little bit of olive oil and salt to the dough. I’m not sure if I can taste a difference or not but it’s been working for me. I also use large eggs now as I’ve started buying the dark yolk eggs from Trader Joe’s. If anything, the dough has been easier to work with with large eggs as opposed to extra large eggs. The Gorgonzola sauce is quite good if fattening. The flavor of the Gorgonzola definitely ripens as it is allowed to sit at room temperature but the sauce itself is very well balanced. It went well, for me, with a 2005 Palmina Dolcetto. In a large saucepan, place the gorgonzola, milk, and butter over low heat. Stir with a wood spoon, breaking up the gorgonzola. Cook for a minute or two or until the butter melts. Add the heavy cream and increase the heat to medium-low. Cook until the heavy cream has thickened slightly, about 2 minutes. Cook the pasta in boiling salted water until slightly undercooked. Add the pasta to the sauce. Cook the sauce for 1 minute more, stirring in the pasta. Serve immediately with extra grated parmesan cheese on top.